Many students decide to become a forensic anthropologist after watching highly glamorized television shows that depict these scientists as intuitive crime solvers. The field of forensic anthropology is heavily involved in the criminal justice system, but biological anthropology is equally important. The road to becoming a forensic anthropologist starts with a realistic self-assessment. Students must be prepared to spend up at least eight years studying and training in school for a doctoral degree needed to practice forensic anthropology with law enforcement agencies. However, students must face the fact that the majority of forensic anthropologists work in universities and only occasionally consult with law enforcement on cases from time to time. Almost all forensic anthropologists are either professors or researchers. Students who do practice hands-on forensic anthropology must be prepared to deal with cadavers, disturbing cases and decomposing body materials. Once students overcome these obstacles, they should join an appropriate degree program. According to the American Board of Forensic Anthropology (ABFA), there are very few employment opportunities for students with only a bachelor’s degree to work as a forensic anthropologist. Students have the option of pursuing a bachelor’s degree in general anthropology to become an entry-level lab technician, or they can pursue a higher education to become an actual forensic anthropologist, according to the Bureau of Labor Statistics. An Master’s in Forensic Anthropology program will start with rudimentary classes related to human anatomy and biological anthropology. All degree programs will cover osteology, which is the scientific study of bones, and taphonomy, which is the scientific study of organic decay. Forensic anthropology students will have the academic opportunity to gain knowledge of highly specialized classes related to bioarchaeology, zooarchaeology and forensic crime scene investigations. Almost all forensic anthropology positions require at least three to four years of relevant case work, or at least an equal amount of lab and field work experience. All forensic anthropologists are expected to obtain certification through the ABFA. The full day ABFA certification exam includes a multiple choice section and a practical skills section. 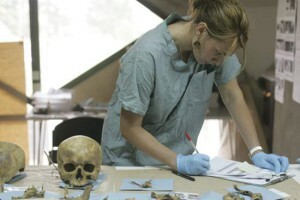 The multiple choice exam tests the examinee’s comprehension of forensic anthropology. Examinees should be familiar with current forensic anthropology literature, such as forensic journals and publications. The hands-on portion consists of stations that contain tools and equipment needed to complete standard forensic procedures. Students who want to become forensic anthropologists should have a strong knowledge of molecular biology, human anatomy and organic and biological chemistry. They should also have excellent technological skills because they will use complex software systems and instrumental analysis to perform their duties. Forensic anthropologists should have a strong attention to detail because the majority of their work will revolve around analyzing microscopic pieces of human evidence. Having a passion for the natural sciences will help forensic anthropologists excel in their position. Finally, they must also be able to maintain their objectivity, composure and professionalism while viewing and discussion disturbing crime details. Students who want to become a forensic anthropologist should search the American Board of Forensic Anthropology’s website to find a certified college program.